we rolled into san francisco, along with the fog. it’s a little unsettling to see how it swallows the entire city like a thick blanket, when there’s such a sharp contrast with clear, sunny weather just a few miles to the south, but once you’re in the thick of it, you’d never know the difference…except that it’s unseasonably cold. since we weren’t on a honeymoon budget this time around, we stayed at the chancellor hotel in union square. now the chancellor doesn’t have the overstated luxury of the fairmont, but the room was nice, especially for the price. it was updated, with a fun kelly green accent wall, pillow menu & adorable rubber ducky to go along with the deep tub…not too shabby. our room was at the end of the hall, kind of in a corner, where the door swung in at an angle that made me feel like i had to step in the bathroom to be able to get out, which was totally unnecessary, but i did it every time anyway. but before we could even check in, i had a panic attack because, after being out on the open highway for most of the day, i felt like the buildings were closing in on me. i made tom circle the union square area, while i tried to remember how to breathe & he tried to figure out what the hell he was going to do with me. by the time i was able to compose myself enough for the general public, we had just enough time to check in, unload our things, drive our rental car to the parking deck a few blocks away & throw on some comfortable shoes for our walk to the financial district for dinner at tyler florence’s restaurant, wayfare tavern. it may seem a little bit crazy to travel across the country & eat southern food, but we really love tyler florence‘s food, so we had to try it. it’s usually my restaurant policy to order something that i wouldn’t/can’t make myself. so, to order deviled eggs as an appetizer? it felt a little silly. they were delicious, though…family tradition meeting curry oil & crispy shallots. my entree was a little underwhelming, unfortunately. i got the chicken paillard, thinking i would love it as much as i do the one in tyler’s ultimate, except not so much. i should have just gone along with the fried chicken, because tom’s was delicious, as was the mac ‘n’ cheese we split as a side. actually, it ended up being too much food for the two of us, so we had the leftovers packed up & called a cab to take us to lower haight. 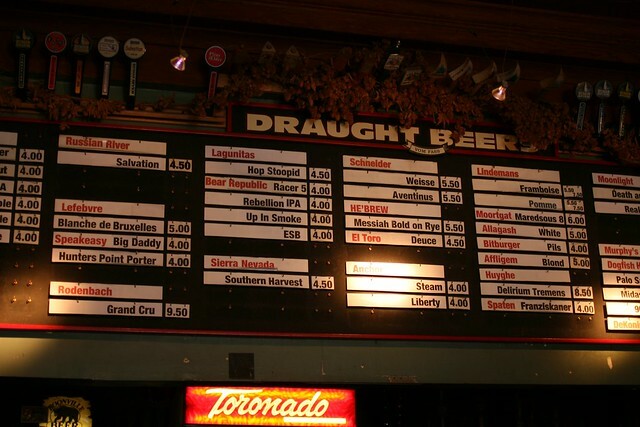 toronado: dive with amazing beer. also, the final stop necessary to earn our west coast bar crawl badges on untappd. This entry was posted in travel and tagged beer, san francisco, tyler florence. Bookmark the permalink.